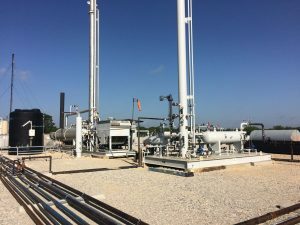 An existing customer in the Eagle Ford shale drilled a new well with a higher composition of CO2 than other nearby wells and required treating options in order to meet pipeline specifications. This customer prefers working with TransTex as we offer reliable equipment and provide expert operational service. They requested assistance in moving an existing leased 10 GPM Amine Plant from LaSalle County to this location in Karnes County. We also upgraded the LaSalle County facility with a newly leased 25 GPM Amine treating facility. This swap required proficient project planning by our fabrication facility and the installation teams. 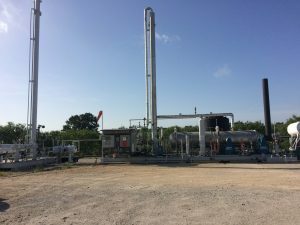 The equipment was delivered on April 2nd and the well start-up and commissioning was on May 9th.